Partial Inventory Counts – How can we help? Partial counts are normally an inventory count (or stock-take) on a small section of your inventory, usually a particular brand, type, or supplier's items. Completing regular partial inventory counts helps you to keep on top of your inventory, and ensures that your end-of-year inventory count runs more smoothly. When should you complete a Partial Inventory count? Many retailers complete these during regular open hours in order to help keep your store's inventory accurate during the year. 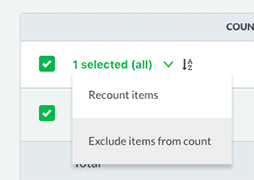 You can even run multiple partial counts at the same time (just make sure you don't have the same product in more than one count). We recommend regularly scheduling your partial counts throughout the year. Because you can schedule in advance, you can easily stagger these to ensure full coverage of your inventory each quarter, for example. How do you complete an inventory count? With Vend inventory counts, you can schedule your counts in advance, so you can plan out your year and your team can see what they need to prepare and count. Before you begin: If you're planning partial inventory counts, make sure you've set up your products with brands, types, suppliers and/or tags to help you refine your searches. Learn how here. 1. Click the Products tab in the menu bar, and select Stock Control. 2. Click the Inventory Count button. You'll be taken to the Inventory Count home page. 3. Click the Add Inventory Count button. 4. Choose which outlet your inventory count is for. 5. Set the date and time for the inventory count (this will default to today's date, and can't be in the past). 6. Give your count a name (something that will tell you what you're counting or why). 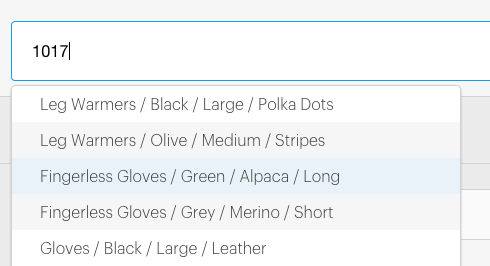 Search for the term 'Jeans' and select the type 'Jeans'. All products with the type 'Jeans' will be added to the count. Then, search for the term 'Levis' and select the brand 'Levis'. This will remove any products from the count that don't have the brand 'Levis' as well as the type 'Jeans'. Search for the term 'Lee' and select the brand 'Lee'. This will add any products with the type 'Jeans' and the brand 'Lee' back into your count. In other words, and products with the type 'Jeans' and either the brand 'Lee' OR 'Levis' will be included in your count. You can tell when a tag or type is part of the same group as they will be grouped together under the search bar, like in the image above. You can also add individual products to your partial inventory count. 9. Once you've added all the items you want to count, click Save & Exit to save your scheduled count. 10. You can also click Start Count to start counting immediately. On the day before, or the day of, your inventory count, depending on how much you're counting, you'll need to prepare your inventory to be counted. Tidying all areas you'll be counting, including any items on hold. When you're ready to start your count, open the inventory count home page. 1. Find the count you want to start in your Due list. 2. Click the count name. The count settings page will open. You don't need to worry about updating the date and time if it's wrong - we'll update it to today's date. 3. Click Start Count. The inventory count will commence. You'll see a page with a list of all your items to be counted, as well as the expected count for those items. You don't need to count the items in the order they appear on the page. Important: Do not count any items currently on lay-away/lay-by. These items have already been debited from your inventory and will cause an inaccurate count. Scan the barcode of each item. If you're doing this, make sure you tick the Quick-scan mode box. Scan the barcode once, and then manually enter the count of every item. Search for an item's name or SKU, and then manually enter the count. Find the item in the list. and click the row. Then, enter the count amount. (Not available in Quick-scan mode). When an item is counted, it appears at the top of your counted list. It will have a tick next to it if you've reached the expected quantity. It will then appear in Your last counted items on the right hand side of your screen. The number of items in your uncounted tab will also be reduced. Your count will automatically be saved - you can see the latest save time at top of the screen next to the Pause button. Inventory tracking is enabled for this product. The product is not set to inactive or, if it is, that you have specified the count to include inactive products. Once all your counts are submitted, you'll need to review your counted items. Unmatched: This lists all items that had a count greater or less than the expected amount. This includes items where you expected a negative amount, and counted 0. Tick the box next to an item, and choose to Exclude items from the count. Tick the box next to an item, and choose Recount items. This will set the count for these items to zero, so you can count the items again. Click Resume button at the top of the page, and count the items again. Important: If you resume counting, the item will still show the quantity scanned so far. Use the Recount items option on the Review page to reset to zero. 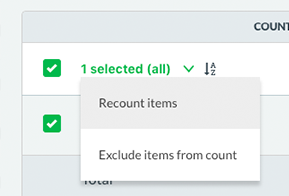 Alternatively, on the count page you can enter a negative quantity for that item in the quantity field to remove items, or to zero the inventory level for an item to start from scratch. If you were trading while counting, you will need to make any final adjustments based on sales or returns made during your count period. If you sell or return an item after you've counted it, that item will need to be adjusted. For a sale, you'll need to decrease the count quantity by one in your inventory count. For a return, you'll need to increase the quantity by one. Note: Any sales made when conducting and inventory count will still be correctly recorded in your sales history. Once you've checked and confirmed your count, and are satisfied all items are accounted for, click Complete. Remember, don't do this until ALL of your staff have completed and saved the counts on their devices. If you have any uncounted items, we'll alert you, as the inventory count for these items will be set to 0 when you click submit. Once you've clicked complete, we'll start processing your count. This can take several minutes to complete, especially if you've got lots of items. Once it's complete, the results will be displayed on the page. These will list your items, the expected amounts, the final counts, the change in units after your count, and any associated cost for that change (for example, if you're one unit short, it will tell you what that costs you). Scrolling down to the bottom of the list will display your total changes in units and total changes in costs. You'll see two figures for each of these - the total increases (for items where your count was higher than expected) and total decreases (for items where your count was lower than expected). Click the export buttons to get a copy of your results. Generate CSV Report: This gives you a CSV file with a line for each product counted. You'll also have columns for expected and final count, change in cost, and total value of each product's inventory after count. This is typically used for importing into another system or for creating your own reports. Generate PDF Report: This gives you a formatted PDF report, including the expected and final count, change in cost, and total value of each product's inventory after count for each product. You'll also have a summary with total changes for your whole count. On the right-hand side of the page, you'll see a list of your most recently scanned items. If you've made a mistake, just click the trashcan icon to remove that item from your count. When you're finished counting, click Review. Quick-scan mode enables to you rapidly scan each item's barcode in your store to add it to your inventory count. Your scanned item will automatically be counted as soon as you scan the barcode. If you'd prefer to use the barcode to look up the item SKU and then enter the final count number before submitting it, un-tick the Quick-scan mode box. When you are performing a partial count you can sometimes get a red "unexpected" symbol next to your products. When this symbol appears it means that a product has been added to the partial count that doesn't match any of the filters you specified when creating the count. If you would like this symbol to disappear you may need to create a new partial count and broaden your filters. If you have already started counting or are happy to continue with your current count you can simply ignore the symbol and continue as it will still accept the adjustment for this "unexpected" product regardless. If you are certain that this product should fall under the filters you've applied, head to the product screen and edit the product in question to ensure that it's been setup correctly. Sometimes, you may need to stop doing an inventory count that you've started. This may be because you've run out of time to complete it, for example, as an inventory count should always be completed in a short time period. This is called abandoning a count. Tick the box next to the count. Open the drop down at the top of the count list. You can view historical counts and export the results at any time. Click the Completed tab on the inventory count home page. Click the count you wish to open.